Have you ever thought to buy a domain name with less than 1 dollar? Today, I will share the collection of $0.99 coupons for .COM domain name. This is the lowest price from GoDaddy. 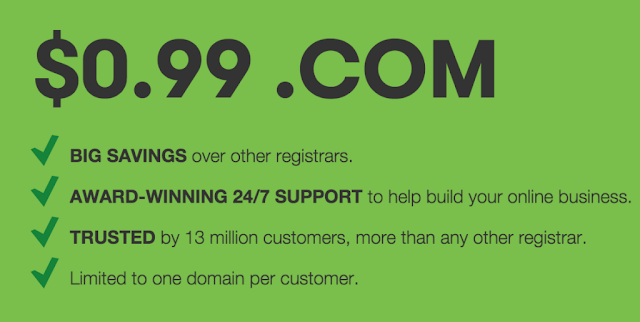 GoDaddy is a leading domain registrar in the world. The company is famous for providing high-quality domain & hosting services. Besides, their support team is so nice and helpful whenever you meet an issue. You can get the most competitive price on domain all the time, especially for .COM domain name, from only $0.99. These $0.99 coupon codes are only valid for new customers who has never used this kind of coupon before to register a new .COM domains. Some coupon codes can also used to transfer domain from other providers. CJCEB99 - $0.99 price good for the first year of one new or transfer .COM per customer. Plus ICANN fee of $0.18 per domain name per year. Valid for first year of one new registration or transfer the .COM domain. Cannot be used for renewals. Go to the article .com renewal coupon if you want renew them. In some cases, the 99 cent coupon only used once per account. So, if it’s not working with you, please switch to another code, like $3.00, this promo code can used for many times and work for all customers. See this page if a coupon has been applied but not give you a discount. Each coupon code can be used once. Plus ICANN fee of $0.18/per domain/year. For $0.99 domain at GoDaddy, not all payment methods valid with this offer, acceptable payments will display in cart at checkout. Credit/Debit/Prepaid Card and Checking Account are acceptable. And some offers just for US. and CA customers. These coupons are especially dedicated to customers in specific countries. Please choose your Country/Region to get the promo price. CJC99R - .COM just Rs 125! CJC99UK1 - CJC99UK - SPECIAL OFFER! .COM just £0.99*! Additional .COMs just £6.99* per year! cjcrmn3cp - Domain Privacy for ONLY $1/year! gd71316a - 35% off Search Engine Visibility, just $1.99­​​/mo ! CJCHONEY99 - CJCRMN99 - cjc99com - 99 cent a .Com transfer to GoDaddy, Free 1-yr extension! How to use a godaddy 99 cent promo code ? Click to the blue button where have the coupon values that you needed at the top of this page, then click to copy button. Go to Godaddy, search your .Com’s domain name, then add them to Shopping Cart. On the GoDaddy Checkout page, look the right panel, click to the Add link at the “Have a promotional code?” section. Then paste the working 99 cent coupon that you had copied in this post. Then click Apply. ***Please leave a comment below if any of them expired.